Since I was ten, I have been searching for the perfect non-rice pudding. My mom used to make the best rice pudding, and when we discovered I was allergic to rice, I had had my last bowl. *sigh* It has been so long that I do not remember the taste. Nonetheless, rice pudding was the inspiration for this dish. It is baked slowly with milk, like the old fashioned classic. 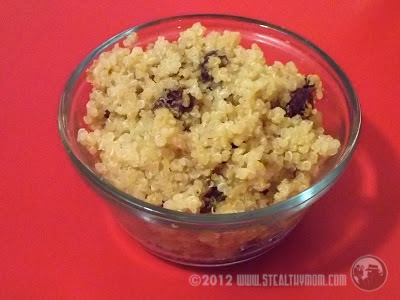 Plump, juicy raisins and hints of nutmeg and cinnamon compliment the quinoa grains. Butter a casserole dish. Mix all of the ingredients except the raisins together in the dish. Bake for an hour at 300F, uncovered. Turn the oven down to 250F. Stir the mixture up in the dish, and drop in the raisins. Return it to the oven to bake for another hour and a half at 250F. Serve warm or cold. A night in the fridge makes for a great breakfast! This recipe is shared with Monday Mania, Fat Tuesdays , Slightly Indulgent Tuesday, Tasty Tuesdays, Frugal Days Sustainable Ways, Real Food Wednesdays, Simple Lives Thursday and Full Plate Thursdays the Living Well Blog Hop, Fight Back Friday and Empty Your Archives- Puddings. Another recipe that I can't wait to try! I don't see why not... It is cooked for hours, really slowly. The only thing about a crock pot is how it limits evaporation. Less liquid, maybe? The only time I had quinoa was at a demo at work. I thought it was tough and chewy but then I found out that it might taste that way if it was not properly cooked. I'll have to try it again. I am thinking Breakfast,Treats and Desserts. I love this recipe, it is great that you can bake it in the oven. I can't wait to make it! Hope you are having a great week end and thank you so much for sharing with Full Plate Thursday. i bet it could also be made in a rice cooker. thanks for the recipe!